The signs of deflation are now flashing all over the globe. In our estimation, the possibility of an associated financial crisis is now dangerously high over the next few months. As we’ve been saying for a while, our preferred model for how things are going to unfold follows the Ka-Poom! Theory as put out by Erik Janszen of iTulip.com. That theory states that this epic debt bubble will ultimately burst first by deflation (the "Ka!") before then exploding (the "Poom!") in hyperinflation due to additional massive money printing efforts by frightened global central bankers acting in unison. First an inwards collapse, then an outwards explosion. Ka-Poom! In other words, instead of saying to ourselves: Hmmm.... it was probably a terrible idea to pile up debt at 2x the rate of income growth, what the world did instead was to double down on that terrible idea and pile on more debt at 5x the rate(!) of nominal GDP growth. At any rate, what all of that money printing, lower interest rates and new debt creation did was force capital over the globe to look for some place to go. Absent any really good and creative ideas, that money primarily chased yield. It piled into risk assets like stocks and junk bonds, often in bubble-like fashion (meaning, in haste), and without proper due diligence. The only way the central bank “strategy” (and we use that word very loosely) could have worked was if very rapid economic growth emerged to justify the accumulated levels of debt, comprised of both old and new borrowing. Central banks were indeed hoping such growth would materialize and lesson the burden of servicing the interest on all that debt. But that growth, quite predictably (as forecasted by us among many others), did not emerge. Perhaps Japan’s experience should have tipped the central bankers off as to why not. For several decades now, Japan has served as a warning: too much debt is the malady, not the cure. So here we are. What are we to make of it all? It's our view that the financial markets are important to monitor because they will signal to us when sentiment has shifted, and let us know in advance that events will unfold at a faster pace. Judging from the market action over the past month, we think that shift has happened. And we're increasingly concerned that this next ‘correction’ could be pretty rough for a lot of folks. The global economy is downshifting fast, and there are lots of flashing red warning lights indicating as much. The Federal Reserve is flailing and global currency markets are in disarray. Notably, the Brazilian real dropped more than 10% in five sessions, before Thursday’s sharp recovery reversed much of the week’s loss. This week the Colombian peso dropped 3.0%, and the Chilean peso fell 3.1%. The Mexican peso dropped 1.9%. The Malaysian ringgit sank 4.5% for the week, with the South Korean won down 2.7% and the Indonesia rupiah losing 2.2%. The Singapore dollar fell 1.8%. The South African rand sank 4.4% and the Turkish lira fell 1.4%. 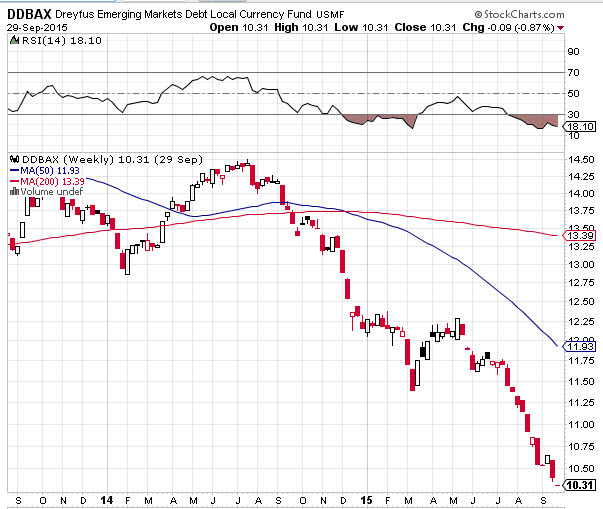 Notably, market dislocation was not limited to EM. The Norwegian krone was hit for 4.4%, and the Swedish krona lost 2.0%. The British pound declined 2.3%. The Australian dollar also lost 2.3%. The global Bubble is bursting – hence financial conditions are tightening. Bubbles never provide a convenient time to tighten monetary policy. Best practices would require central bankers to tighten early before Bubble Dynamics take firm hold. Central bankers instead nurture and accommodate Bubble excess. It ensures a policy dead end. As the unfolding EM crisis gathered further momentum this week, the transmission mechanism to the U.S. has begun to clearly show itself. While “full retreat” may be a little too strong at this point, the global leveraged speculating community is backpedaling. Biotech stocks suffered double-digit losses this week, as a significant Bubble deflates in earnest. It’s also worth noting that the broader market underperformed. What does it mean when we see currencies in retreat across the globe? It means that the hot, speculator money is rushing out of weaker economies and back towards the stronger center. This is consistent with a liquidity crisis, one where all the borrowed money used to spark all those heady asset gains and falling yields on the way out do the exact opposite on the way back. And Doug is exactly right – there’s never a good time to pop a bubble. So the central bankers just sit, paralyzed, afraid to even raise rates by a token amount for fear that the daisy-chain of global bubbles will burst as a result. They needn’t fear: the bubbles will burst no matter what the Fed, et al., does. A credit default swap (CDS) is a bit of insurance you can buy if you own a bond and are worried that the issuer may default on it. In a stable climate, the cost of that insurance (measured in percentage points above the stated yield on that debt) is pretty flat. It's usually close to the yield of the bond in question. So you might have to pay 1% to 2% (i.e. 100 to 200 basis points) above the yield on, say a Brazilian ten year bond, to insure it against a default. As things begin to break down and become less certain, that cost will rise. See those CDS ‘spreads’ blowing out to the upside? That’s the sort of thing I was tracking in 2008 that gave me a clear, early warning that things were about to fall apart. While these levels are not (yet) flashing the same level of danger that we are seeing in the CDS paper for Glencore (which is almost certain to go bankrupt now), or for US shale drillers (tons of bankruptcies coming there, too), these are pretty serious warning signs to see in sovereign debt. 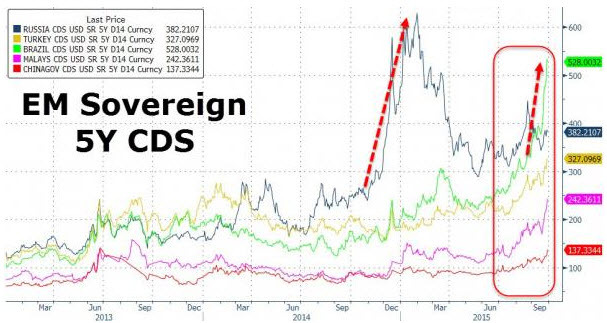 Why would the sovereign debt of Russia, Turkey, Brazil, and Malaysia be spiking right now? Because the hot money is flooding out of those countries. There's now an elevated risk that they may default on their bonds in the future. Developing-country firms quadrupled their borrowing from around $4 trillion in 2004 to well over $18 trillion last year, with China accounting for a major share. Now, prospects in industrializing economies are weakening fast even as the U.S. Federal Reserve is getting set to raise interest rates for the first time in nearly a decade, a move that will raise borrowing costs around the world. The burden of 26% larger average corporate debt ratios and higher interest rates come as commodity prices plummet, a staple export for many emerging-market economies. Compounding problems, many firms borrowed heavily in dollars. As the greenback surges against the value of local currency revenues, it makes repaying those loans increasingly difficult. So the afflicted countries are going to see vastly weaker exports, plunging currencies, and their local corporations unable to pay off dollar-denominated loans -- on borrowing that ballooned from $4 trillion in 2004 to over $18 trillion just 11 years later. It’s an amazing statistic, one of many fostered by a cluster of central banks that know everything about blowing bubbles but nothing about ending them. Decoded, that means that $18 trillion is a big number. If even a small portion of that goes into default, it could easily drag down whole swaths of the developed world’s financial corporate structure. A systemic crisis that would begin on the edge but rapidly spread to the center. Ouch! Based on the above chart, the past year has been painful indeed for those emerging market corporations and governments. No sign of a bottom yet either. One so-called ‘bright spot’ in the world economy is the US, which supposedly is doing better than everyone else. As you know, I consider US GDP statistics to be nearly useless because of all the statistical tricks and gimmicks that are now deployed (such as now counting ‘intangibles’ to go along with Owner Occupied Rent which records the price value of people not paying themselves rent, etc.,) to make things look better than they are. (Reuters) - Mexico's factory-made exports slumped in August by the most in more than 6-1/2 years after uneven growth in the first half of 2015, data showed on Friday, while consumer imports rose. Manufactured exports sank 7.2 percent in August compared with July, falling back after two months of gains, the national statistics agency said in a statement. It was the biggest month-on-month drop since December 2008, data showed. Mexico exports mostly manufactured goods like cars and televisions and about three-quarters are sent to the United States. It’s hard to imagine that the US economy is doing fine when a major trading partner who exports 75% of its finished product to the US is experiencing a deep export slump. For the first seven months of 2015, U.S. exports dropped 5.6% to $895.7 billion. The value of South Korean exports shrank a revised 14.9% in August from a year earlier, the sharpest fall in six years, as shipments to China dropped. Chinese imports in August fell 13.8% in dollar terms from a year earlier, after an 8.1% decrease in July. If this keeps up, 2015 will see the worst global trade performance since…wait for it…2008. For the US, 2015 will be the first year that exports have declined since the financial crisis. Ditto for a number of other countries. 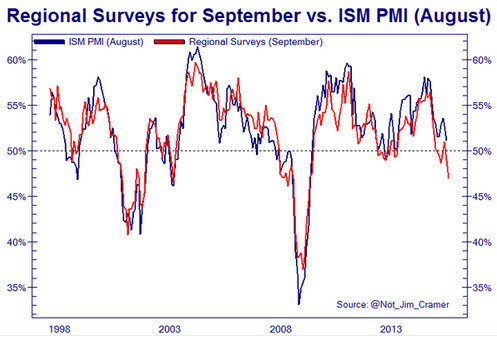 Beyond exports, the surveys of US manufacturing and service sector activity are also flashing recession warning signs. 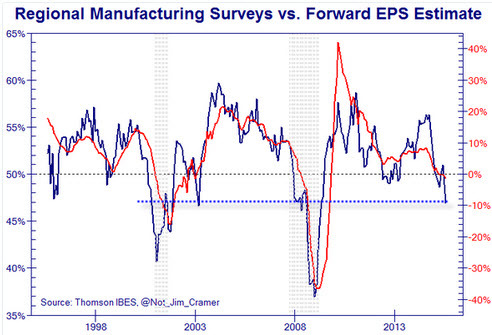 In fact, the manufacturing survey has only been this low in the past during prior recessions. Maybe this time is different? On the plus side for the US: reasonably robust housing activity, low initial claims for unemployment, and growing income and expenditures. But the data for some of these is suspect (nearly 100 million working-age adults are not counted in the workforce), and in other areas, not robust enough to hang too many hopes on. Add it all up, and there are a number of signs that not only is the US economy is far from robust, it may even be teetering on the verge of a recession. 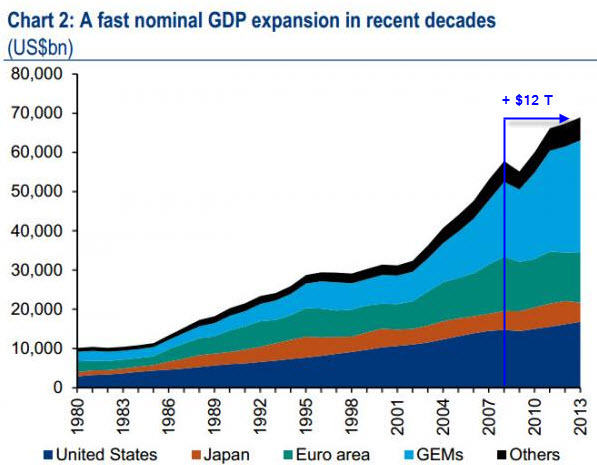 But the global economic landscape is decidedly tilted towards contraction, not expansion. Why is all this important? Because seeing these signs early enough gives us a better chance to mentally, financially, and physically prepare for the next shock. The press does a very good job of constantly painting everything in a rosy light, and that’s fine, but it’s not very helpful if it also misleads. Lots of people are woefully unprepared for what’s coming next. For many it will be a shock. Not because they couldn’t see it coming years in advance and made their own mental and financial adjustments on their own terms, but because they wouldn’t. Preferring to avoid an unpleasant truth they put it out of sight and out of mind, hoping that somehow things would work out in their favor. In Part 2: From Deflation To Hyperinflation, we detail out the likeliest progression of the unfolding deflationary rout and the inevitable tsunami of money printing that the central banks will respond with, unleashing the final hyperinflationary chapter.